Here at Crowded Earth Kitchen, we don’t buy bright colored, sugary cereal. The problem is that Santa Claus is a mischievous guy, and leaves Mom-Disapproved cereals under the Christmas tree. The kiddos LOVE this, and for a few weeks they are able to indulge in occasional bowls of silly breakfast cereals. By late winter, this Mom’s patience with Santa has worn thin, and it’s time to get rid of the neon colored breakfast food. This recipe gives the pint size cooks in your kitchen a fun opportunity to an after school snack out of those bits and specks of breakfast cereal lurking in your pantry. 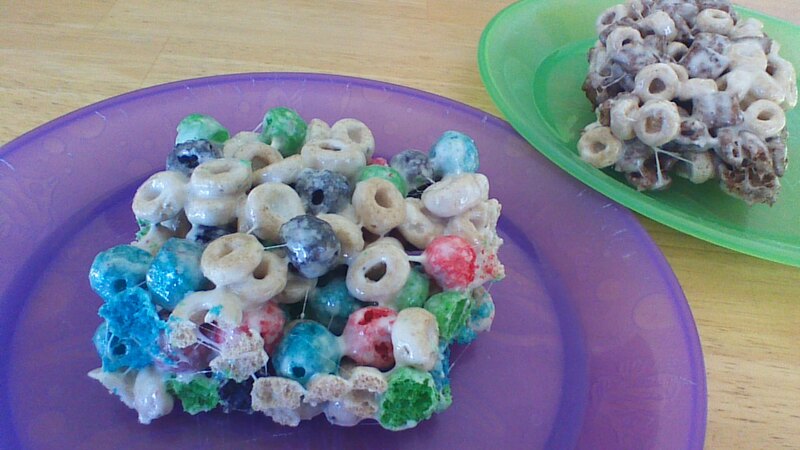 These cereal bars are most fun when you let the kids mix cereals. Why should Rice Crispies get to have all of the fun? Step 1) Melt butter and marshmallows together in a large saucepan over low heat, stirring constantly. 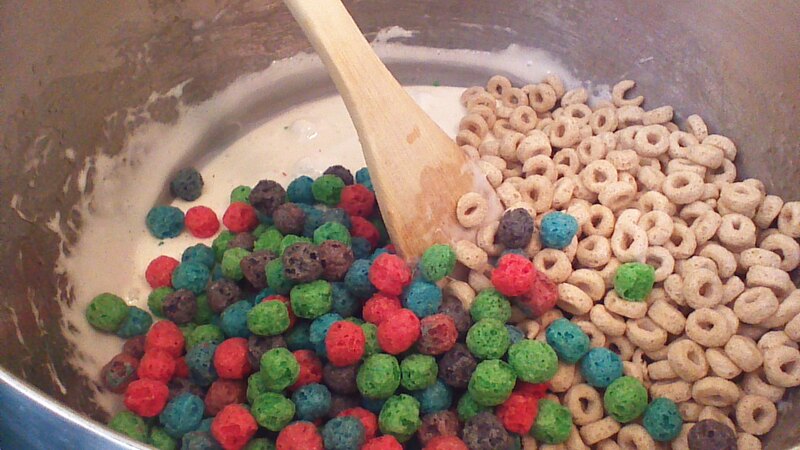 Step 2) Remove saucepan from heat and stir in mixed-up cereal. Step 3) Transfer mixture to a greased pie dish. Using wet hands, press the mixture firmly into the pie dish. Allow mixture to cool and firm up on the counter. Step 4) Cut into squares or wedges using a wet knife, OR place the pie dish in the freezer for about 30 minutes and cut into squares while partially frozen. If you plan to pack these Mixed-Up Cereal Bars in school lunches, wrap them individually in waxed paper. This entry was posted in children, Lunchbox Treats and tagged children, Cooking, Family, Food, frugal, fun, Homesteading, kids, lunch, parenting, Recipes, school. Bookmark the permalink. Lol.. I’m glad I read the first few lines before skipping over this! The brightly coloured cereals put me off but when I read that it was Santa’s fault that made it all better! 😛 What a fun way to use up left over bits and pieces (even if ours are mostly one colour)! Kids in the kitchen is always nice. 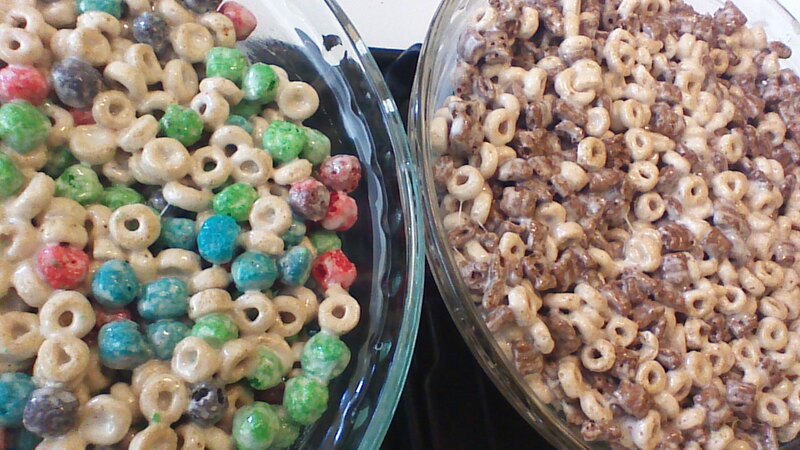 We had a S’more contest last summer – some of the kids made S’mores using colorful cereal. I’ll have to have my “special little bakers” over soon. I’m seeing cocoa puff bars in my future! I imagine that would be quite a hit!